On-host backup of VMs on SMB3 shares is similar to on-host backup of VMs on local storage and CSV. During on-host backup, Microsoft VSS components, File Share Shadow Copy Provider and Veeam Data Mover are invoked on the source host. The File Share Shadow Copy Agent is invoked on the SMB3 server. As a result, all data processing is accomplished directly on the source Microsoft Hyper-V host and on the SMB3 server. 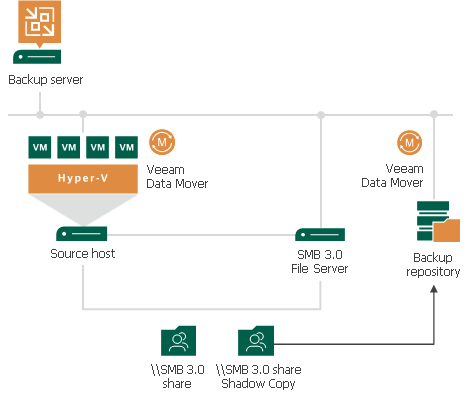 The Veeam Data Mover on the source host accesses the shadow copy file share exposed on the SMB3 server. Veeam Backup & Replication retrieves VM data from the shadow copy, processes it and copies data to the destination.